In Lorenz Christoph Mizler’s Musikalische Bibliothek, a series publications between 1736 and 1754, an obituary of Bach appeared, presumably be written by C. Ph. E. Bach and J. F. Agricola. 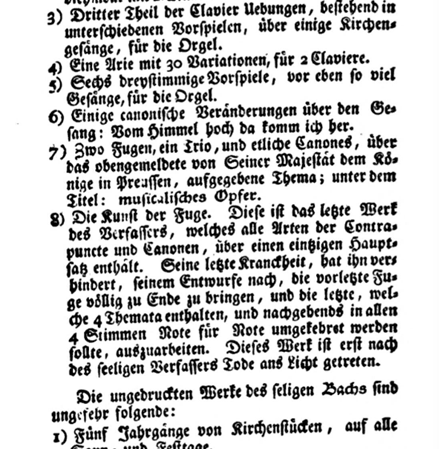 The sentence in the obituary about Der Kunst die Fuge ‘seine letzte Kranckheit, hat ihn verhindert, seinem Entwurfe nach, die vorletze Fuge völlig zu Ende zu bringen, und die letzte, welche 4 Themata enthalten, und nachgehends in allen 4 Stimmen Note für Note umgekehret werden sollte, auszuarbeiten’, have given much confusion. Mentioned is a second last fugue in design and the last, not finished fugue with four themes. The question ‘what is the second last and what is the last fugue of Bach? puzzled a lot of experts. Wolff (1975) states as Nottebohm that Contrapunctus 14 have to be seen as the last fugue and a theme have to be added to it, the theme of the other pieces in Die Kunst der Fuge. Contrapunctus 14 have to be developed into a quadrupole fugue. Bergel (1985) argued that the last fugue and second last fugue are partitions of Contrapunctus 14. The third partition where the third theme is introduced with notes corresponding to the letters BACH is in his opinion the second last, a missing fourth partition is the last fugue. There is no definite proof for both these theories. 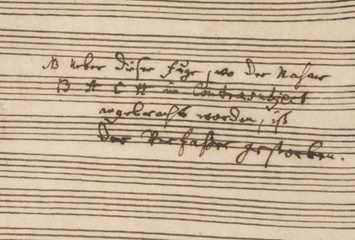 Other theses are also possible, the last fugue can be a fugue Bach was intended to make, it’s also possible that the second partition of Contrapunctus 14 is the second last fugue and the last fugue is the third partition, both not complete. Problem is that the sentence of the orbituary and the piece left are not matching, there isn’t found another last fugue with four themes. And on page 5 of the Autograph, likely belonging to Contrapunctus 14 (3 Soggetti), C.Ph. 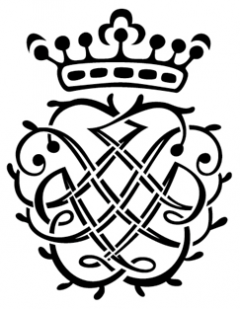 E. Bach noted “Über dieser Fuge, wo der Nahme B.A.C.H. im Contrasubject angebracht worden, ist der Verfasser gestorben“, suggesting that this is the last fugue Bach made, didn’t have 4 themes but 3 themes.